A little more about this particular plane: while it is capable of being set as fine as desired for the finish planing of strips, it is easier and requires less work when carefully adjusted to make a shaving of exactly .002". At this setting, when a strip is planed to completion, it extends above the form by exactly .002" everywhere along its length. In this case the form is set .002" tight to get the desired finished dimension. These numbers for your plane may not be exactly the same-you'll have to find them by testing. But this gage has another use-one that will further improve your accuracy. The usual methods for setting planing forms leave much to be desired. Those that involve test strips or checking the results with a micrometer are simply not accurate since by measuring either the test strip or the finished strip from one flat to the opposite apex the apex is crushed and the reading is less than it should be. Depth gages with 60-degree points are not necessarily reliable either. Chrome plating can alter the angle, or the point itself may not be aligned with the spindle. If either of these conditions exist then setting to zero with a calibrated test block doesn't help. However, with this gage there is a better way. 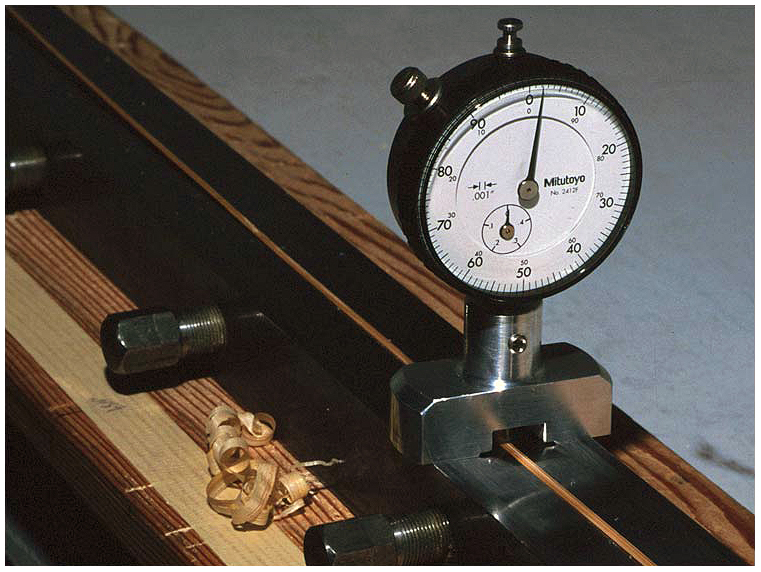 In Issue 26 of The Planing Form, in an article on setting planing forms, Ted Knott showed us his adaptation of a method used for many years by machinists to measure the depth of threads. Of the various methods used for setting forms, this is the most exact. 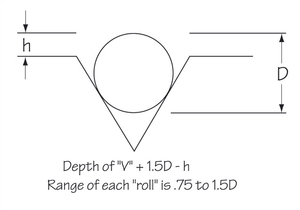 "D" is the diameter of the wire or roll. "h" is the height of the wire or roll above the surface of the planing form. 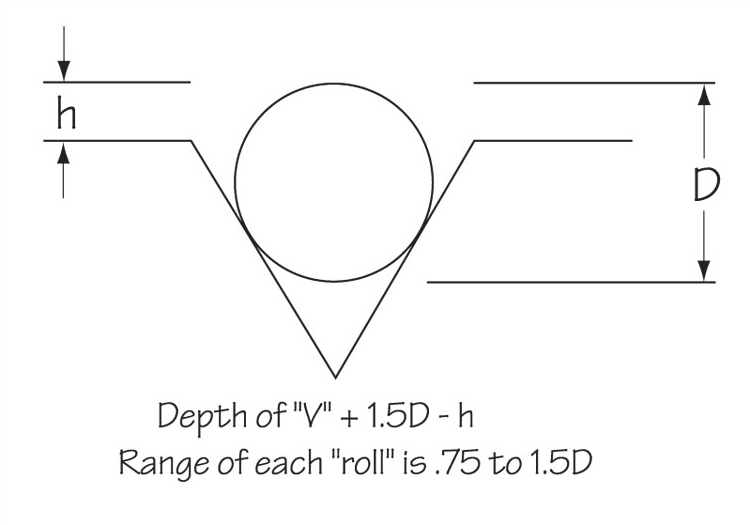 The depth of the "V" is 1.5 D minus h.
Ted noted that with any roll its range for depths would be between 3/4 diameter and 1 1/2 diameters. For example, the range of a .100" wire would be .075" to .150". However, to avoid errors introduced by such things as worn form corners that range should be reduced. A set of three or four wires will be needed. The smallest might be around .030" to accommodate the finest tips, the largest about .160" for the largest butts. Two other wires in between will complete the set. Check around your shop, trying whatever is round but always careful that what you pick is actually round and straight. You'll notice that many of the things we take for granted may not be satisfactory. Shanks of small drill bits, for instance, are not necessarily truly round. On the other hand, some nails are amazingly true. The largest wire here came from a clip made for peg boards, the smaller wires from a hobby store. It helps to bend the last quarter-inch of the fine wires at a right angle to make them easier to handle. 1. set your plane for a .002" shaving and plane a test strip to determine the height of the finished strip above the planing form. 2. use your gage and wires to set the form "tight" by the amount found in 1. 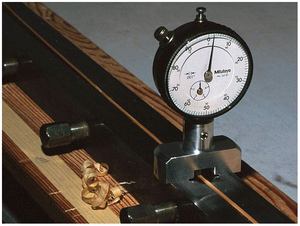 3. plane your strips to completion and use the gage to check. If you are contemplating grooving your plane, make this gage first. It will be helpful in checking the depth of the groove as you progress.